CASA's 3rd Annual "RAISE YOUR VOICE" Singing Competition should "RAISE THE STAKES" for this years participants. Click Here to become a sponsor for our Fourth Annual "RAISE YOUR VOICE" Singing Competition! Click Here To Buy Tickets Online at Proctors GE Theatre! All proceeds benefit CASA (Court Appointed Special Advocates) of the Capital Region. 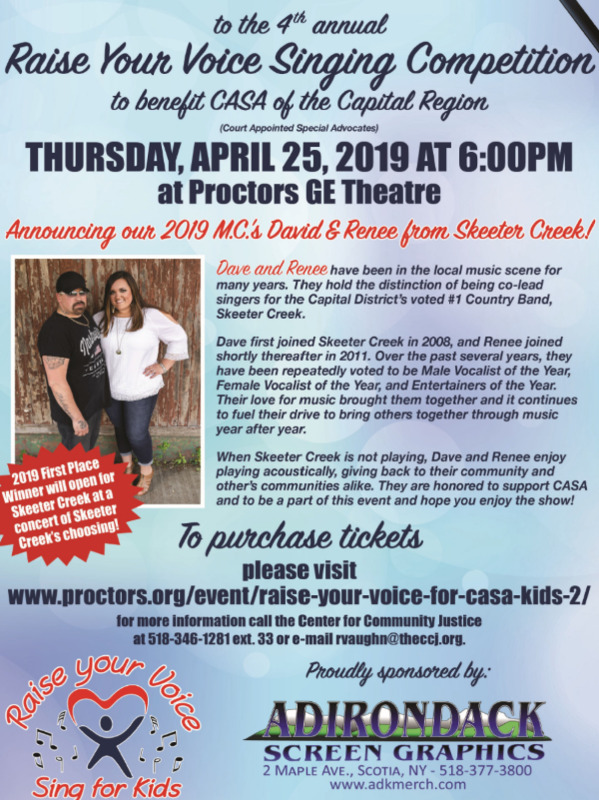 Thank You to Dave Ahl and Renee Lussier-Ahl of the Capital District's legendary country-rock band Skeeter Creek who will be the MCs for this years Raise Your Voice show. third place singers at Proctors!